IO has detailed a new mandatory Hitman update, which brings to the game online profiles, display changes, and more. 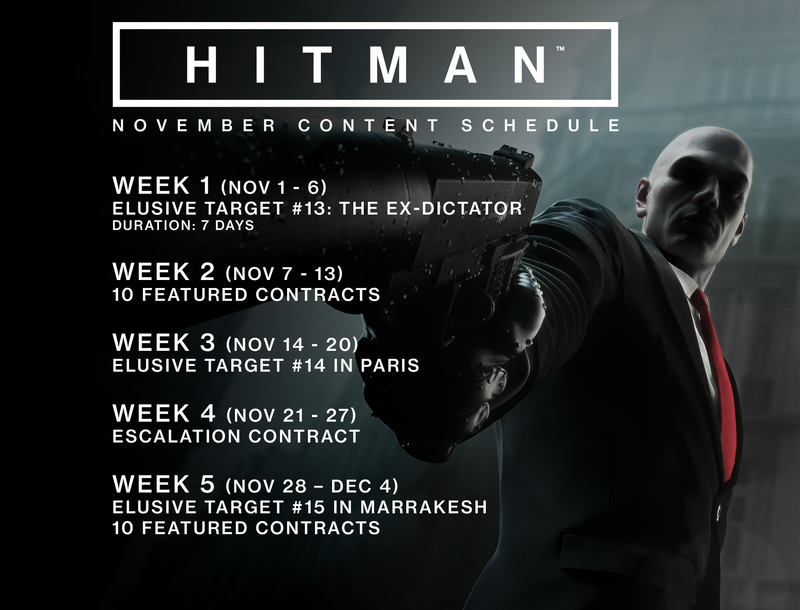 In a post today, developer IO detailed a new mandatory update for Hitman, the "first of a series of planned major game updates that will add new content and improvements" ahead of the January 31st physical disc release. "We always set out to create a game with a major live component and over the course of the first season, we have established exactly that by releasing content each and every week on top of the major location releases," the post reads. The update will go live on all platforms on November 28, with an expected download size of 2.4GB on PS4, 13.6GB on Xbox One and 2.1GB on PC. You can check out the most notable improvements below. The full post, which includes details on the various issue fixes, can be viewed here. All unlockable items that are earned when connected to the game's servers, are now also saved to an 'offline profile', meaning that they can be used when in Offline Mode. We've added functionality to mark an opportunity with a checkmark when it has been successfully completed, similar to how we show that a challenge has been completed. The scoring screen now displays "Silent Assassin" when a player completes a mission with that rating. The 'Statistics' page has been overhauled with a new visual design that displays the challenge completion, mastery level completion and overall location completion. In this update, we've added the ability for 47 to pull people over balconies or out of windows, when he is hanging on a ledge or below the balcony/window. Unfortunately, there is a known issue for this move: NPC's that see this move will not blame 47, even if they are looking directly at the NPC or at 47. For that reason, we will remove this ability with our December Update and fix this. It will then be re-introduced with a game update in January, around the same time as the disc release."